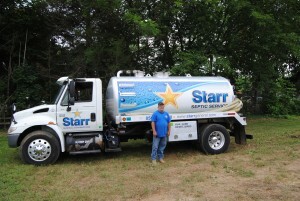 Starr is a Leader in South Jersey Septic Pumping Services. Regular septic pumping is a crucial part of owning a septic system. Most experts recommend pumping your septic tank every 3 years, but frequency should be based on size and volume of usage. If you wait too long to have your septic system pumped it can lead to environmental contamination, toilet backups, flooding and damage to your home. If you look into your septic tank and you see high or standing water at the outlet, it is a good chance your system needs to be pumped.